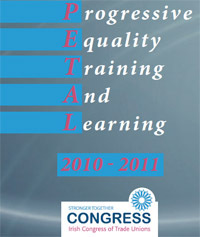 The PETAL programme was launched at the Northern Ireland Equality Comission on the 14th September 2010. The aim is to equip you to promote the law and best practice in the workplace. The topics addressed by this programme reflect the themes and priorities identified by Equality Committees and members. The training will also ensure that union representatives are up to date with developments in the complex area of equality and employment law. For further information click here or contact Jacqui on 028 90247940 or at the email address below.